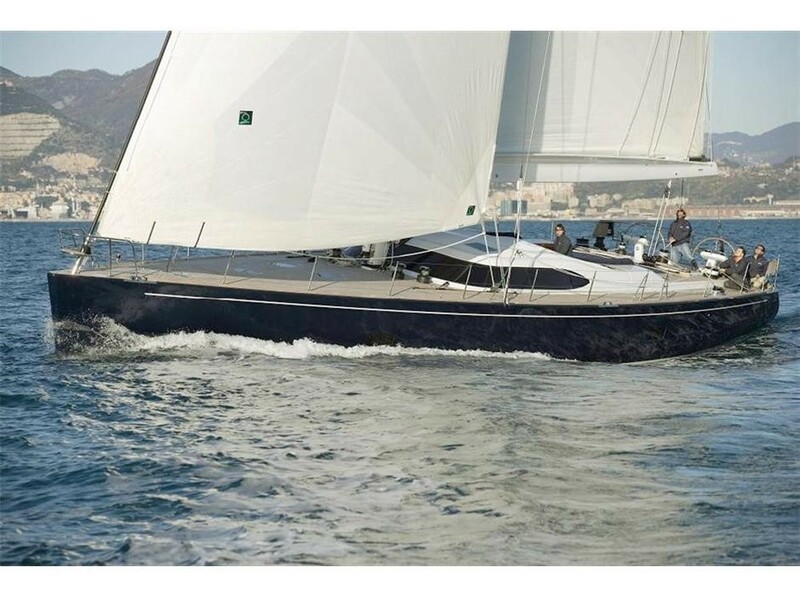 Sailing yacht SI VIS PACEM (ex Matelot) is an 80ft carbon hulled performance sloop designed by the prestigious Farr Yacht Design Office and built by the Italian Southern Wind Shipyard. 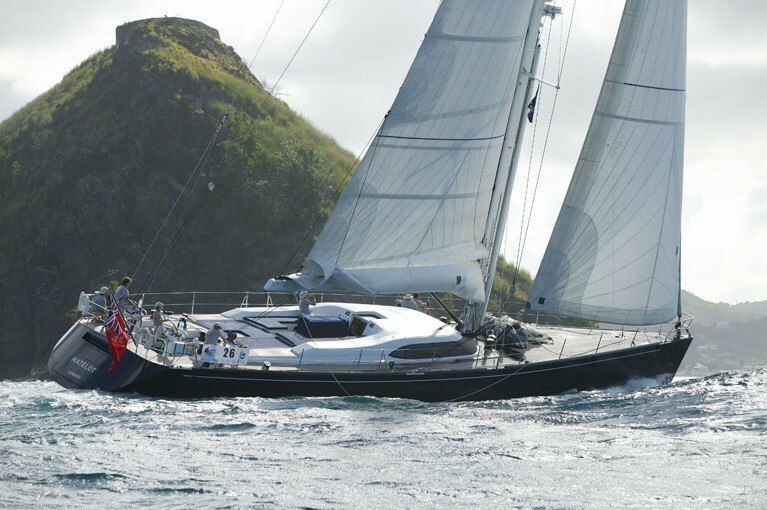 She is fitted out to the highest quality and safety standard and she superbly appointed for up to 6 guests. 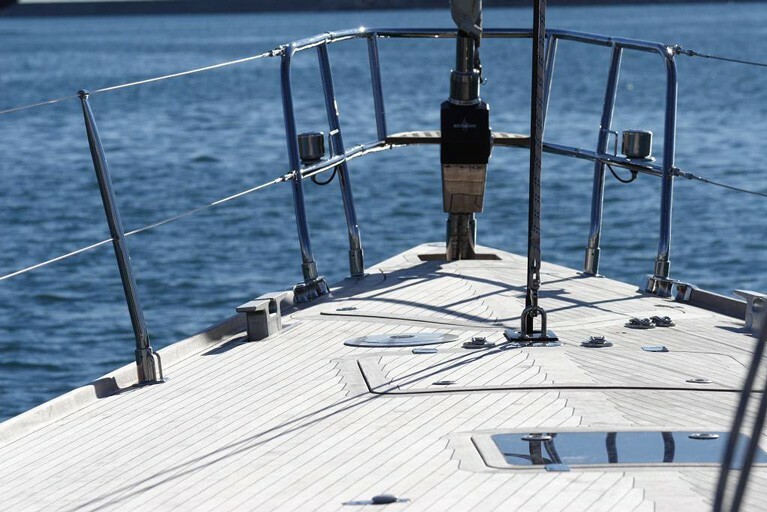 SI VIS PACEM’s quality, attention to detail and styling is immediately evident. 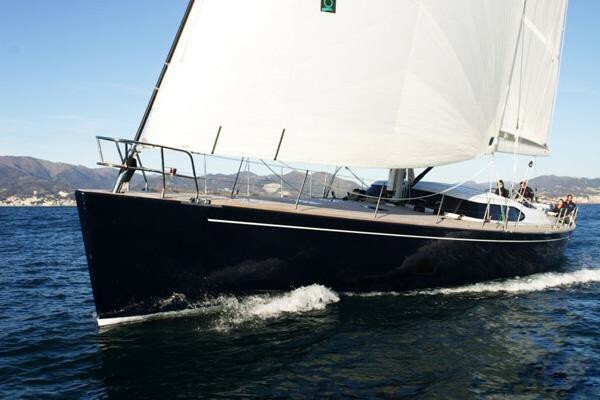 The yachts flush finished deck, dark blue hull, low profile saloon windows and the towering carbon rig are all features that will turn heads while offering safety, comfort and speed for guests on board. 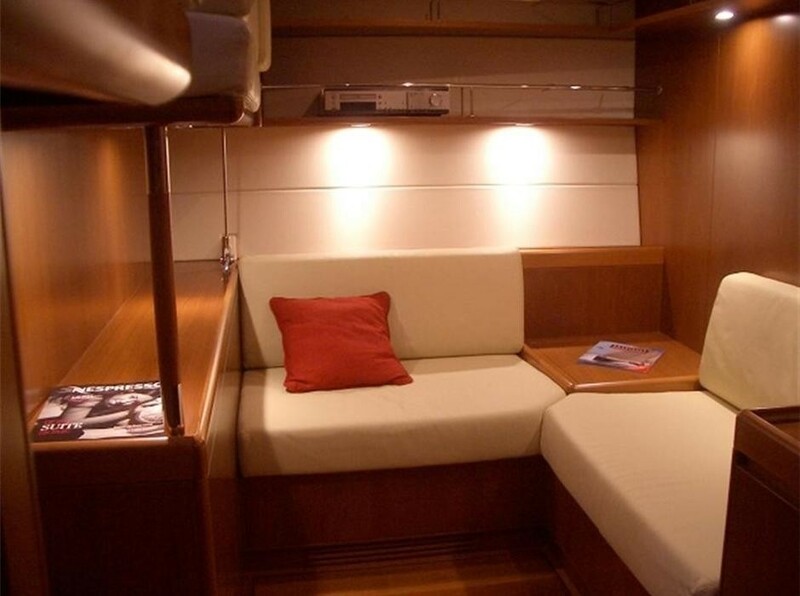 The ergonomically designed guest cockpit is designed to seat 6 guests in absolute comfort. 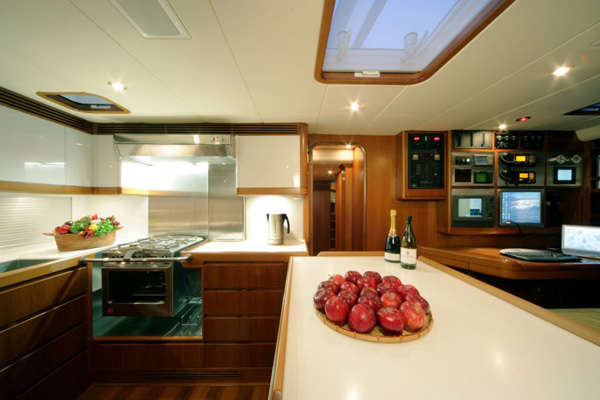 The large cockpit table contains a generous fridge ensuring ice cold drinks at any time and is positioned well clear of the working area of the yacht so guests can relax without being disturbed. 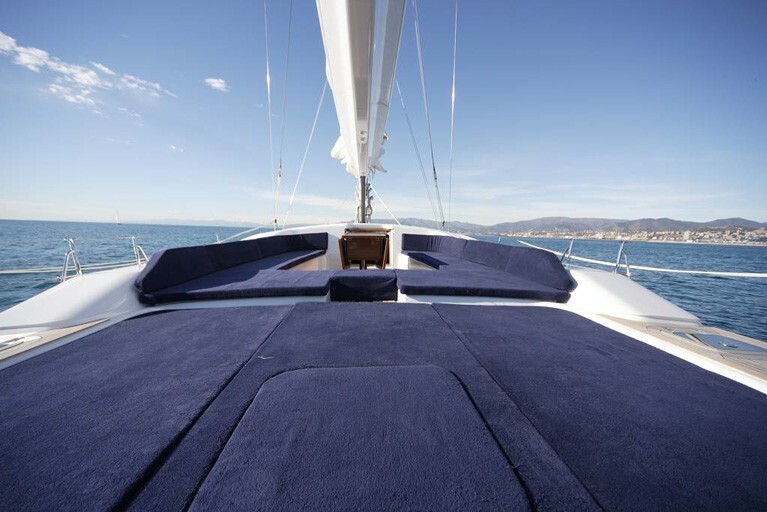 With a bimini over the guest cockpit that can be kept up under sail, guests can either stay in the shade or soak up the sun. 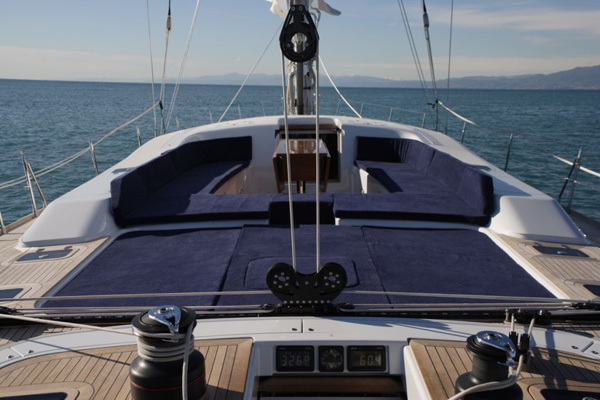 At anchor a large awning can be set protecting guests from the sun. 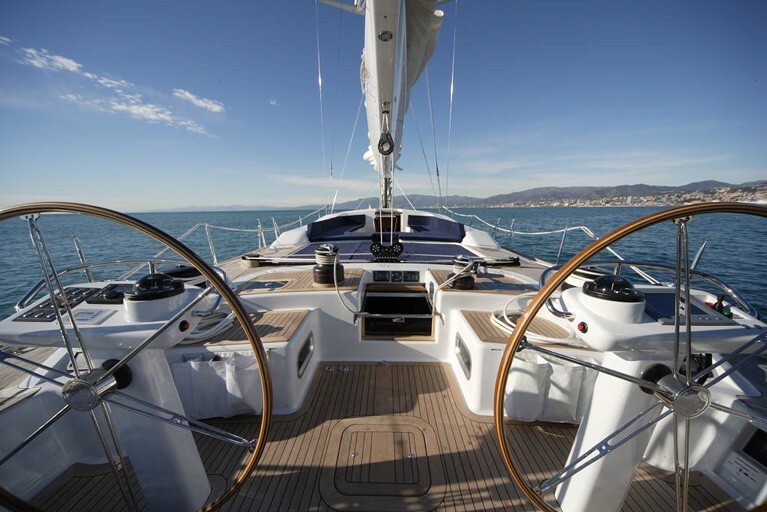 Back aft a working cockpit with two steering positions offer a superb view of the sails when underway. 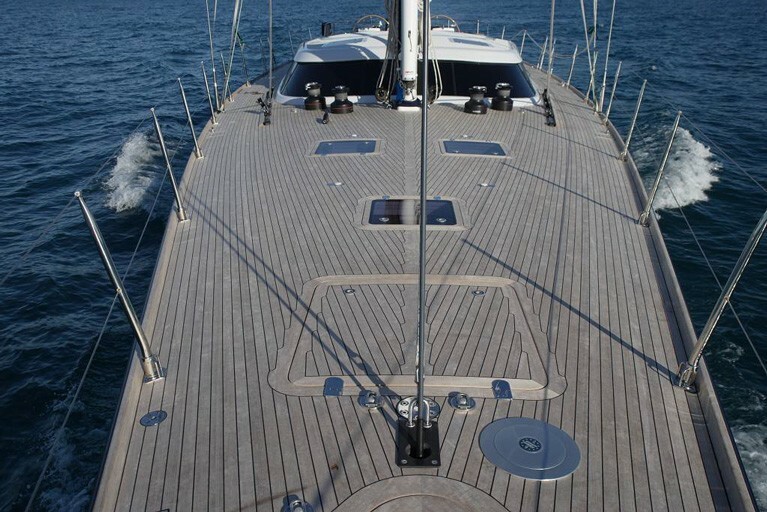 With extensive, uninterrupted and flush teak deck guests have many areas from which to choose to relax or sunbathe. 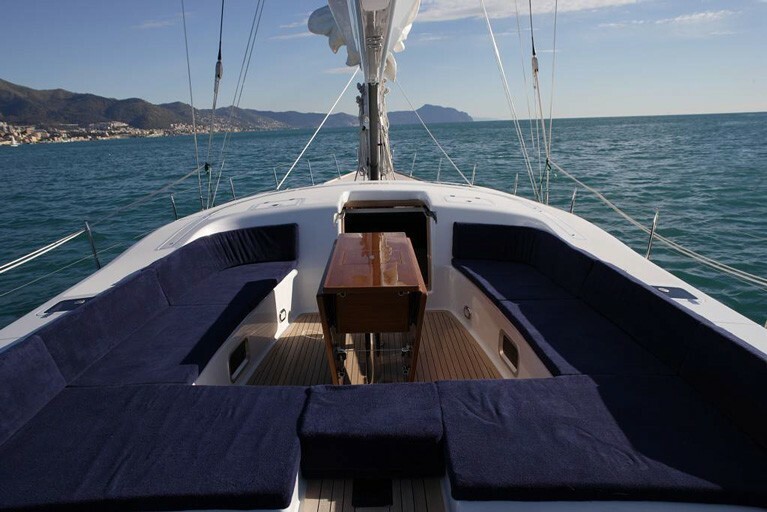 Aft of the main cockpit, the transom is lowered by the push of a button offering a large swim platform from which to dive into turquoise waters or relax before trying out the watersports. 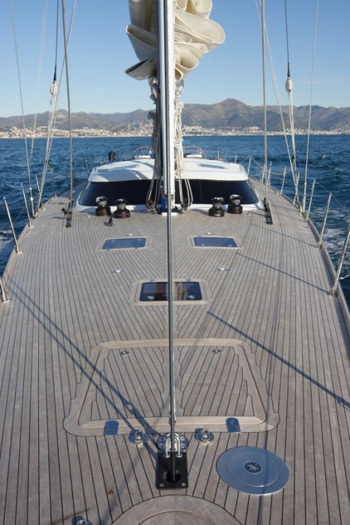 In addition, a hydraulic passarelle is tucked into the transom when not in use, which when extended allows guests to be on the dock within seconds of mooring stern to in harbour. 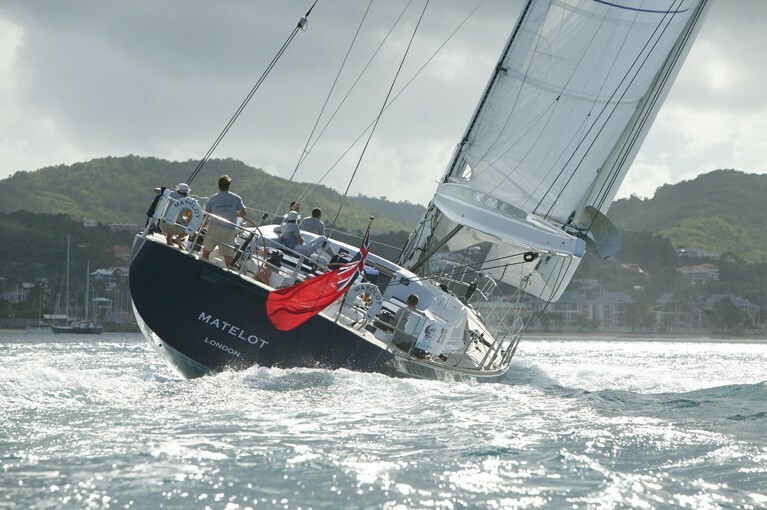 Matelot is equipped with hydraulic furling and the yacht can happily sail in excess of 10knots. 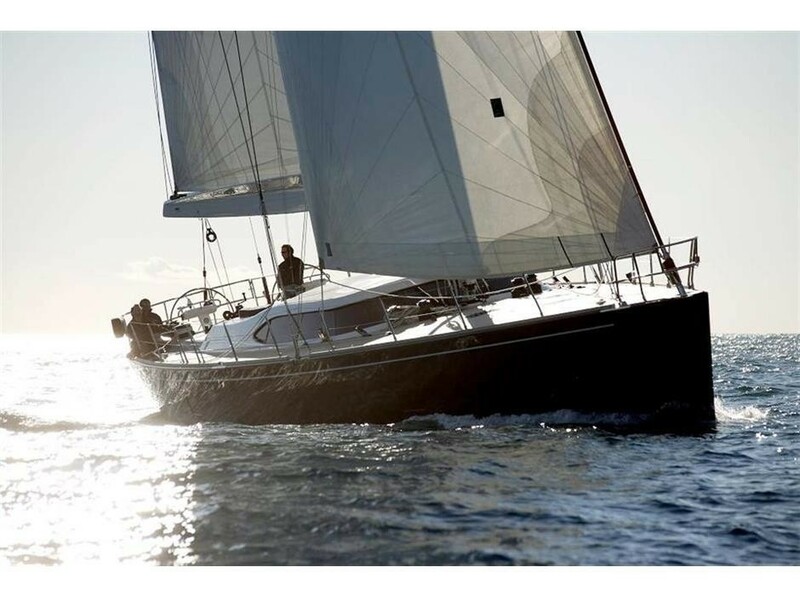 The composite hull provides genuinely breathtaking performance and will entertain sailors of all experiences. 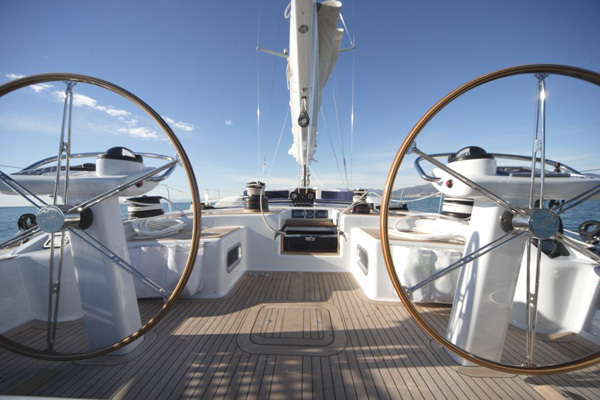 Guests are more than welcome to take the helm or trim the sails or sit back and let the crew sail them to their next chosen anchorage. 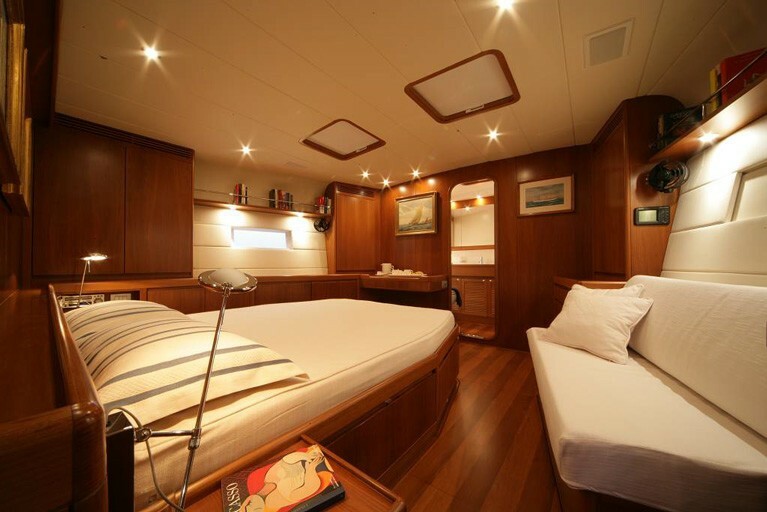 SI VIS PACEM’s interior is fitted with light teak and tan leather upholstery in the saloon and the high class joinery is some of the very best in the world for a yacht of this size. 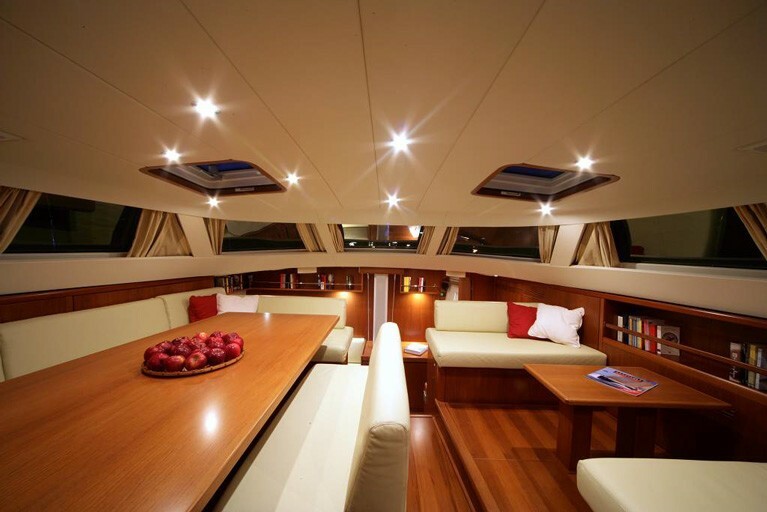 The large saloon windows, hatches and port holes throughout the yacht provide plenty of natural light. 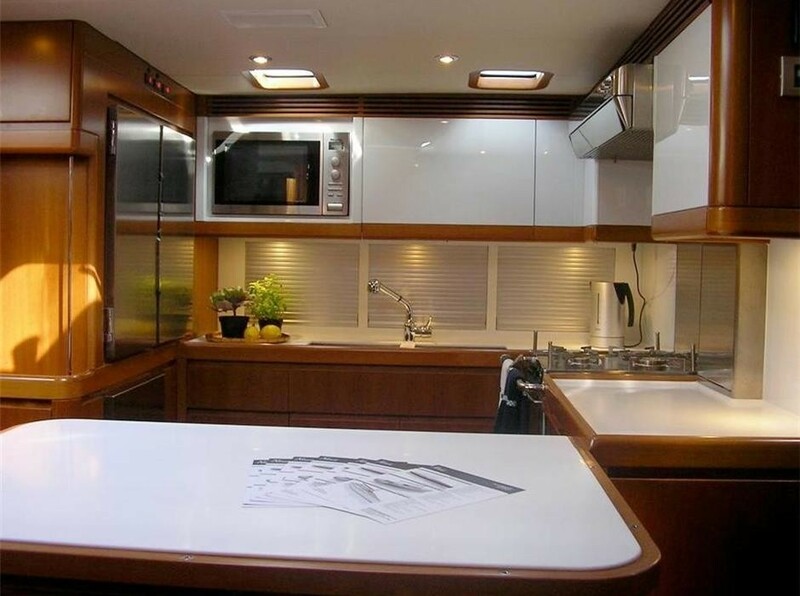 The interior is air-conditioned throughout making it an ideal place to cool off during the tropical midday sun and with two generators air conditioning can be run 24 hours a day. 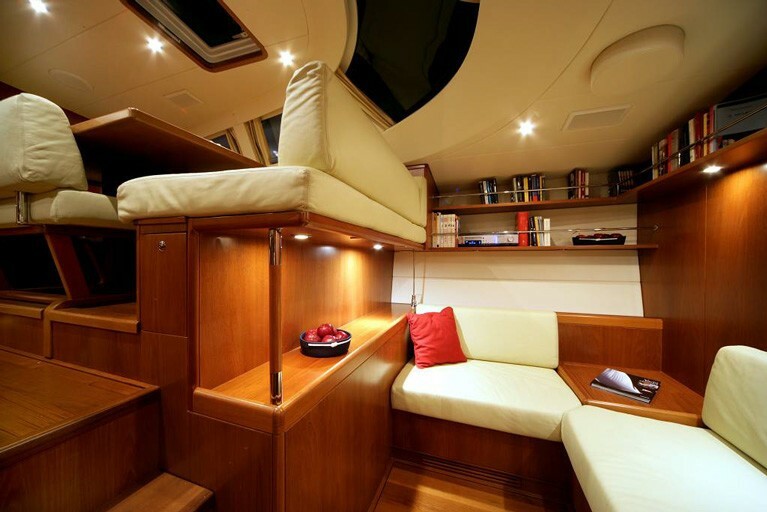 Alternatively, the raised saloon has overhead hatches which can be opened to enjoy the fresh breeze. 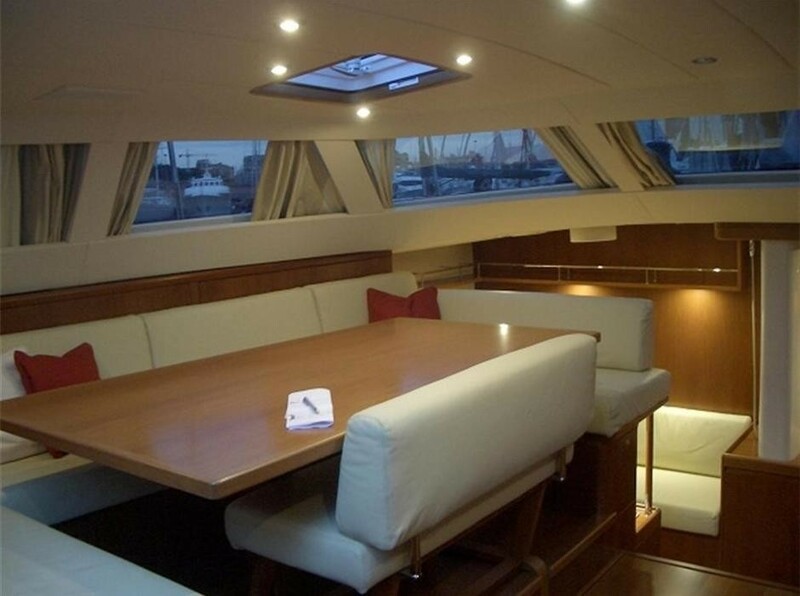 A beautifully constructed extendable teak table in the Saloon is perfect for formal dinners. The yacht also has a 27 flat screen TV where you can watch the latest DVD’s or even follow the position of the yacht from the electronic charts. 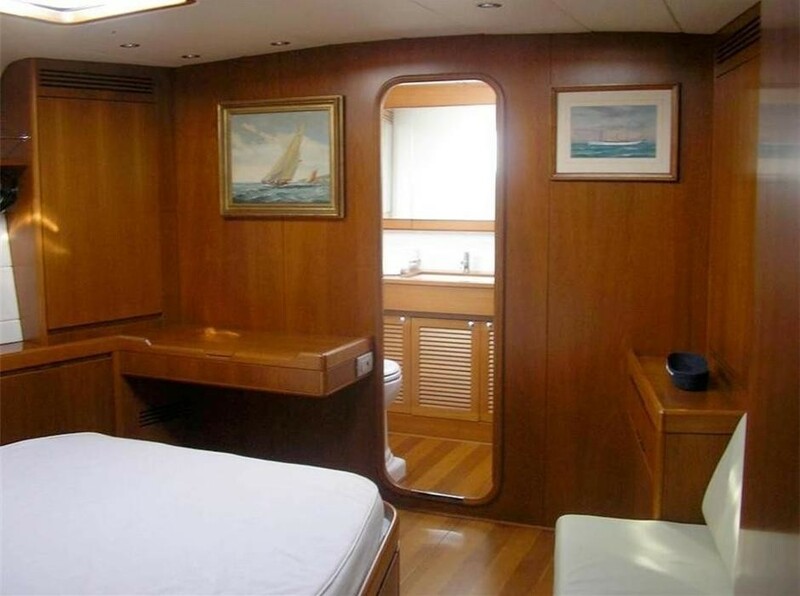 Alternatively, guests can relax in the lower saloon to port. The ONKYO stereo provides superb surround sound quality for music or films, whilst the Playstation 2 should keep the children happy at the end of the day! 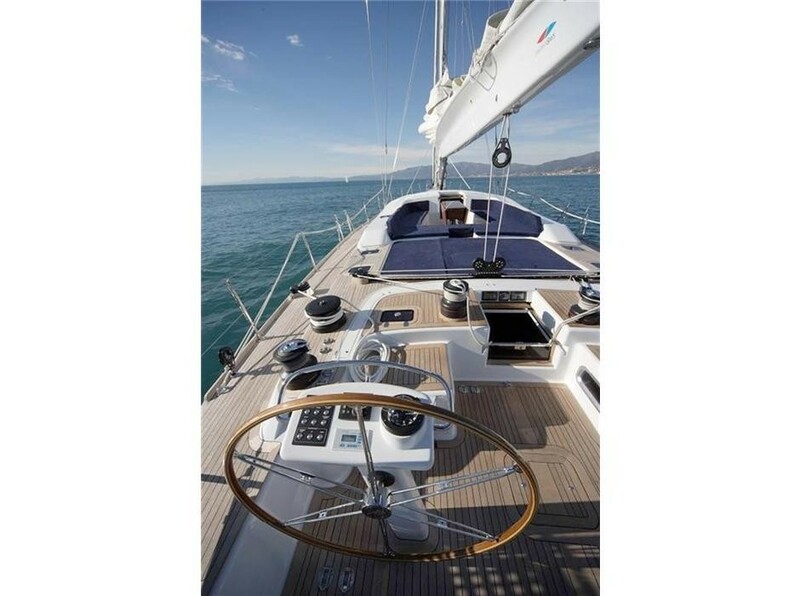 It is also possible to bring your ipod along to enjoy your own music down below or on deck whilst sailing. 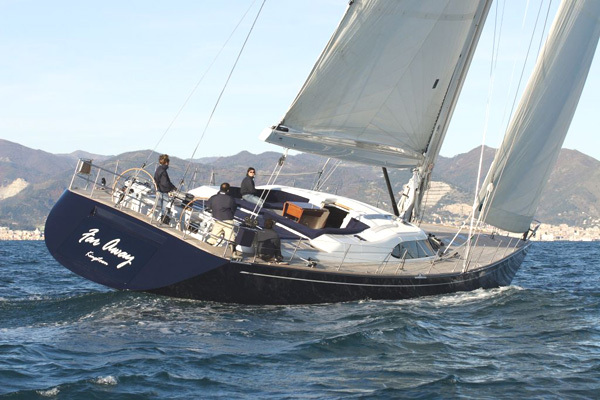 SI VIS PACEM sailing yacht offers accommodation for up to six charter guests. 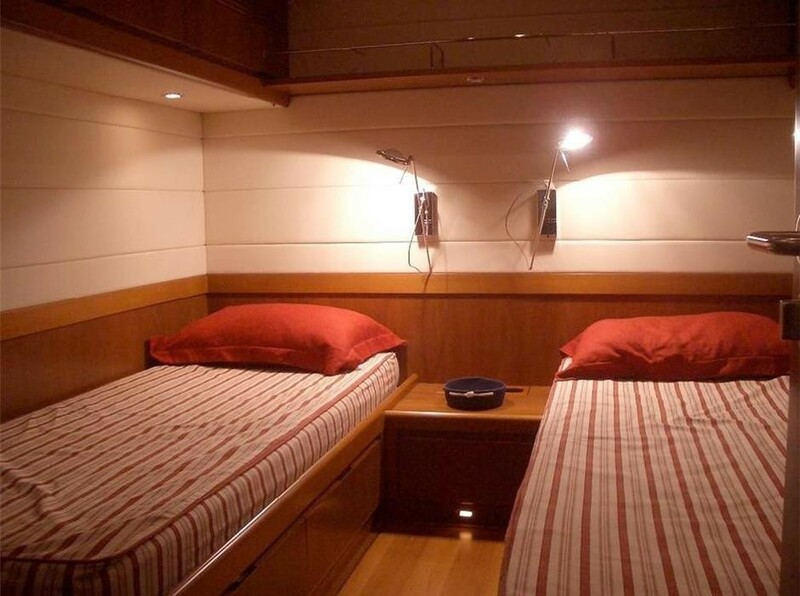 The cabin layout of SI VIS PACEM is ideally suited to families and couples. 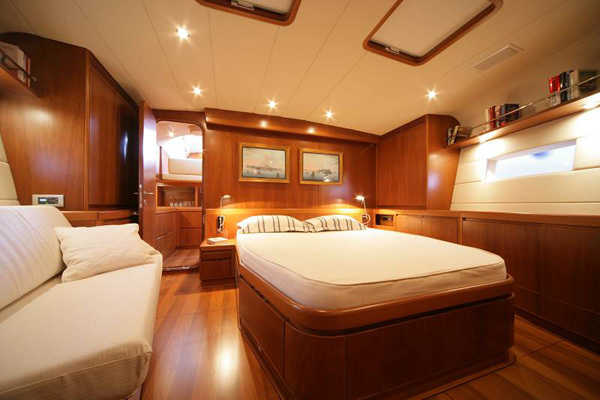 Up forward there is a large master cabin with a king sized double bed and generous ensuite using the entire beam of the yacht. 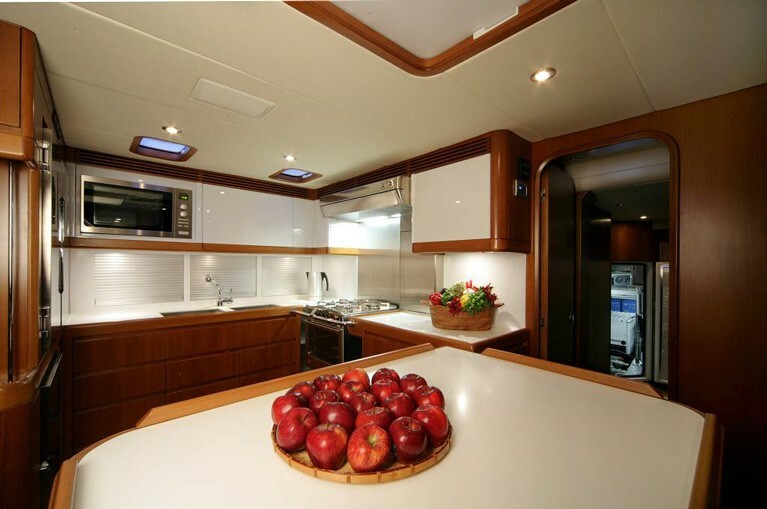 Two large windows provide plenty of natural light for the cabin and two overhead hatches (all with blinds) enhance this further. 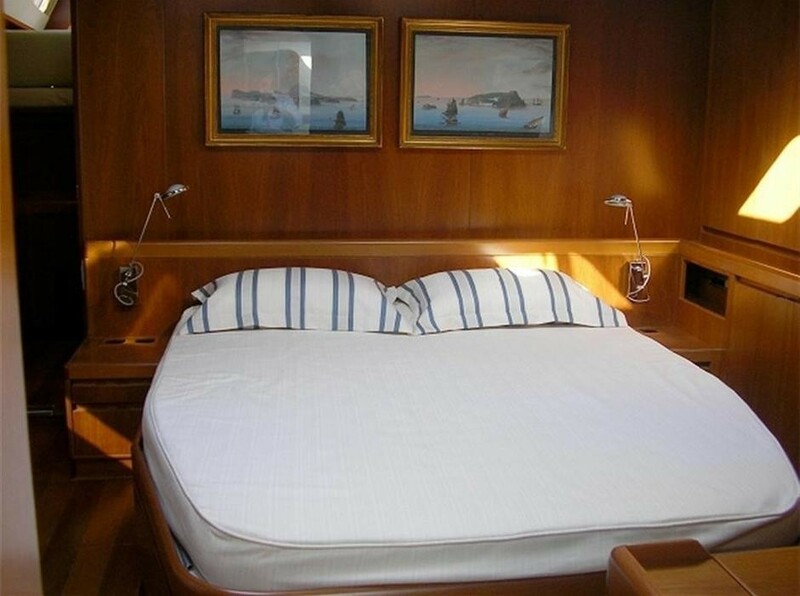 A dedicated ONKYO stereo provides music for this cabin. Aft of the main saloon are two identical twin cabins both with windows and overhead hatches that provide light and great sea level views. 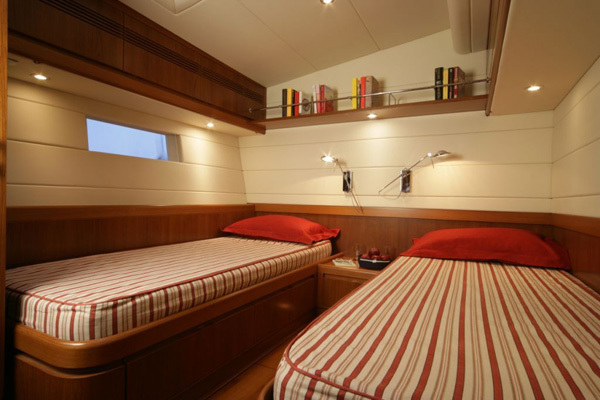 The identical ensuite heads boast separate shower stalls and of course, fully electric fresh water heads. 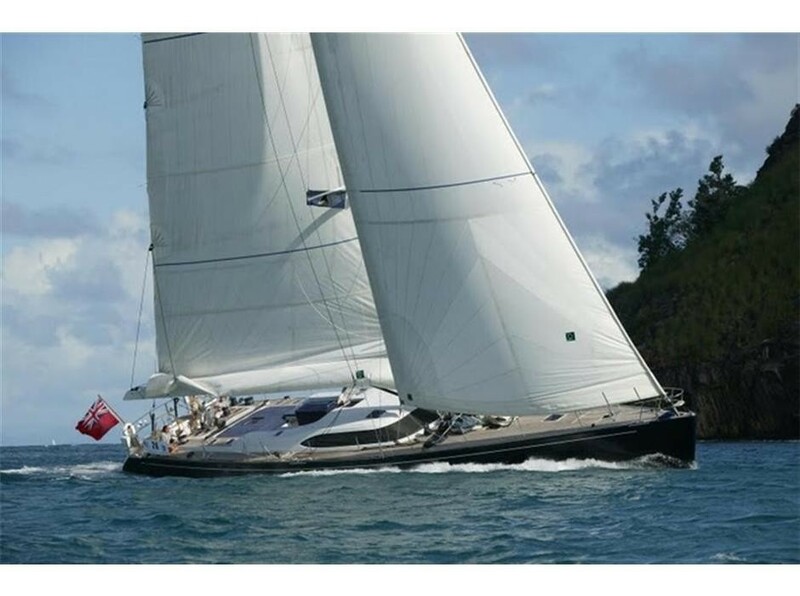 SI VIS PACEM (ex Matelot) provides the following yacht charter amenities and toys: A 4m Avon RIB with a 50hp four stroke outboard fitted with a fixed VHF, low level LED courtesy lights, fixed nav lights, second fuel tank in the bow locker, Raymarine Bi data (speed and depth) in addition to a sky pole for wakeboarding and towing eyes for the doughnut. 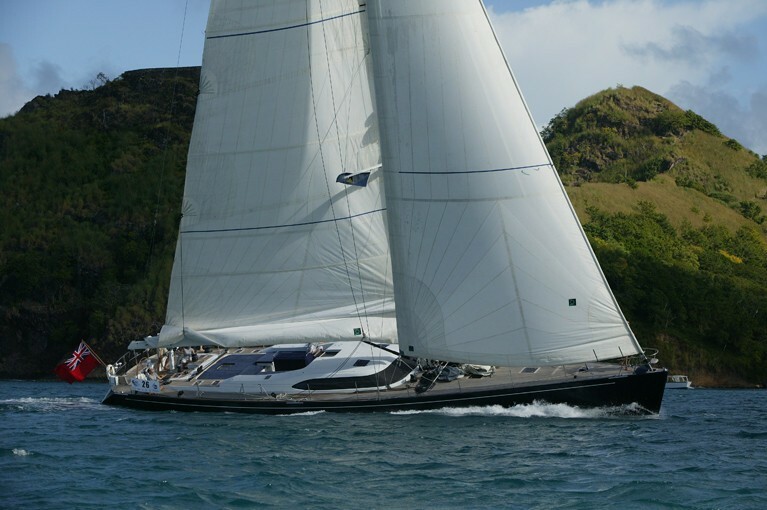 SI VIS PACEM’s ‘toys’ include Water skis (adult and junior), wakeboard, kneeboard, doughnut, snorkeling equipment (most sizes), inflatable 2 person Sevylor Kayak, 4 speakers on deck controlled from on deck, Selection of board games and books, 3 x ONKYO stereo systems c/w FM/AM/ CD/ DVD, Jack for all types of ipod, Extensive DVD and CD library, Playstation 2. 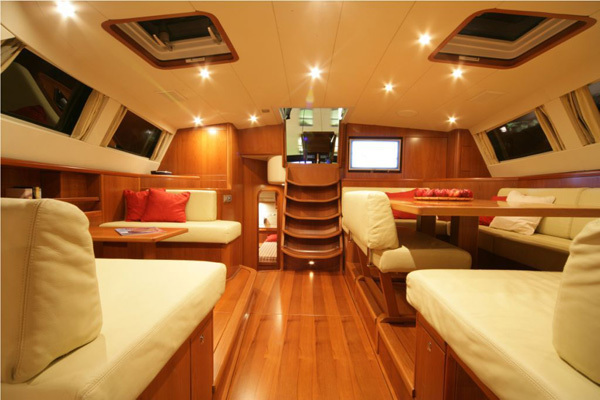 The yacht is also Air conditioned throughout.